Dr. David Harriton is the founder and co-owner of The Animal Hospital of Barrington. He possesses an unrelenting desire to practice the highest quality small animal medicine and surgery. Patient care, comfort and well being are at the forefront of his professional endeavors. His interests inside the office include geriatric internal medicine, soft tissue surgery, pain management, practice management and dentistry. He earned his Doctor of Veterinary Medicine degree from The Atlantic Veterinary College at the University of Prince Edward Island in 1997 after earning his undergraduate degree from Boston University. He is a member of The New Hampshire Veterinary Medical Association, The American Veterinary Medical Association, The Canadian Veterinary Medical Association, and The Veterinary Information Network. His interests outside the office revolve around his three children, wife, Annie the Pug, and UNH Wildcats hockey. Dr. Michelle Harriton is the founder and co-owner of The Animal Hospital of Barrington. She earned her Doctor of Veterinary Medicine degree from The Atlantic Veterinary College at The University of Prince Edward Island in 1997 after earning her undergraduate degree from Dalhousie University in Nova Scotia, Canada. Her professional interests include skin disease of companion animals, radiology, behavior medicine and soft tissue surgery. She is a member of The New Hampshire Veterinary Medical Association, The Canadian Veterinary Medical Association, The American Veterinary Medical Association and The Barrington Chamber of Commerce. Outside the office, she enjoys a variety of activities that involve her three children, husband, Pug named Annie and scrapbooking when her husband is at UNH Wildcat hockey games. 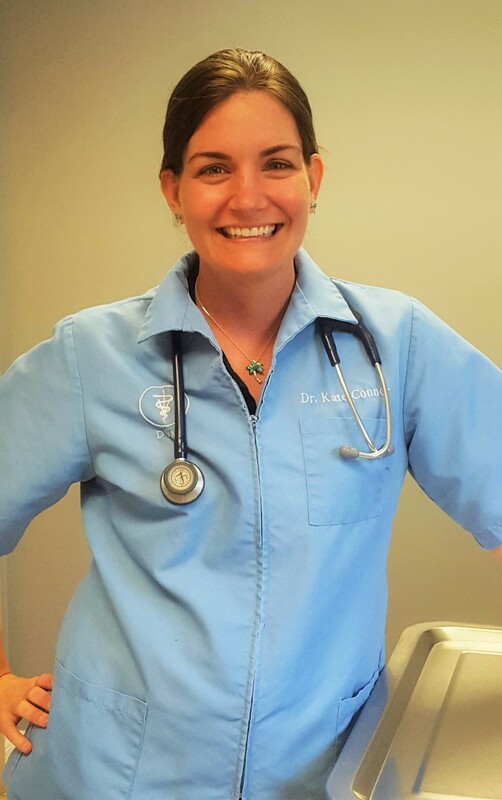 Dr. Kate Connor graduated from the University of Florida, College of Veterinary Medicine in 2011. While at the University of Florida, she pursued her Doctorate of Veterinary Medicine as well as a PhD in Fisheries and Aquatic Sciences. She graduated veterinary school certified to practice aquatic animal medicine as well as small animal medicine. Dr. Kate Connor is a Florida Keys native with strong roots in New Hampshire. Her grandparents had a small farm in Wolfeboro and she spent summers and many family vacations enjoying New Hampshire. She met her husband (a NH native and also a veterinarian) in Florida while attending veterinary school and then relocated to New Hampshire following graduation. This January Dr. Connor and her husband welcomed newborn twin girls. After several years of small practice, Dr. Connor has joined us with special interests in canine and feline internal medicine, dentistry, nutrition, surgery, and client education. Dr. Connor strives to provide the highest quality care and regularly attends continuing education in the area of her above interests. Dr. Connor spends her free time with her family, fishing, boating, hiking, and skiing. Dr. Wells joins us as an experienced veterinarian who has special expertise in integrative medicine. She incorporates "alternative" therapies along with traditional medical approach to achieve the best possible care and outcome for your pet. She has formal training in acupuncture, herbal medicine and nutritional therapy from Tufts University and the Chi Institute of Traditional Chinese Veterinary Medicine and had incorporated this skill set into her practice since 2001. Dr. Wells is a 1993 graduate of Cornell University.